Like most people who make a living by stringing together sentences, I’d like to improve my writing. But I also like to go to parties, road trip around America, and catch up on Empire. Lately, I’ve been trying to toe the line between proactive self-improvement and cutting myself some slack. As I’m assembling a salad or grilling a quinoa burger (or eating a giant bowl of popcorn), I’m listening to I Should Be Writing or The Writing Show. Don’t worry about taking notes, don’t pause the podcast if you have to pop out to put in a load of laundry. Just 80% listen. Have faith that if an idea is good enough, it’ll stick. If doesn’t stick, you’ll probably encounter someone else talking/writing/tweeting about it in the near future! If you write for a living and spend a lot of your free time reading, you might do the same ridiculous thing I do. You inadvertently start writing like the book you’re reading. I DO THIS ALL THE TIME. In fact, if you look carefully you can probably tell which blog posts I wrote while reading Annie Proulx. But I’ve decided to stop fighting it and start leveraging it. I have enough awareness of my own writing voice that I know a (much more talented) kindred spirit when I read them. So if I’m going to be writing like the people I’m reading, I might as well be reading people whose writing gently nudges me closer to a better version of myself. Of course, I’m not going to strictly limit myself to humorous, first-person writing. But in those moments when I’m aimlessly casting around for something to read, I’m making an effort to choose people whose style is like a much, much better version of mine. In the marketing world, a swipe file is a collection of tested and proven advertising and sales letters. YAWN. My writing swipe file is a document on my desktop that consists of links, paragraphs, words, and turns of phrase that have caught my fancy. It’s the sections I’ve underlined in novels and copy-n-pasted bits from blog posts that made me laugh out loud. If I’m looking for inspiration or trying to phrase something better, I paw through this file and I usually emerge wittier and better prepared. If I’m not careful, I could spend the next five years of my life reading blogs, first-person humor essays, and Oprah magazine. If you’re keeping track, all of the above are written in a pretty similar manner, using pretty similar writing voices. Let’s stretch our boundaries and read outside of our comfort zones. Let’s read academic essays and long-form investigative journalism on a topic we know nothing about. Let’s read pieces that have been translated and things written by people who are very, very different from us. We will learn things by reading these pieces. I am consistently floored by the difference a good night’s sleep makes. In the harsh light of day, what seemed witty and tight seems try-hard and exhausting. Or maybe vice versa! Whenever possible, I like to let my writing ‘rest’ for at least 24 hours and then print it out and edit it by hand with an actual pen. Not only is this incredibly gratifying, it’s nice to hold the thing you created in your hands rather than just staring at yet another screen. Weird suggestion: find a brightly colored pen that’s a joy to use. I love this pen – it has 88 five-star reviews on Amazon! Now I’d love to hear from you writers! 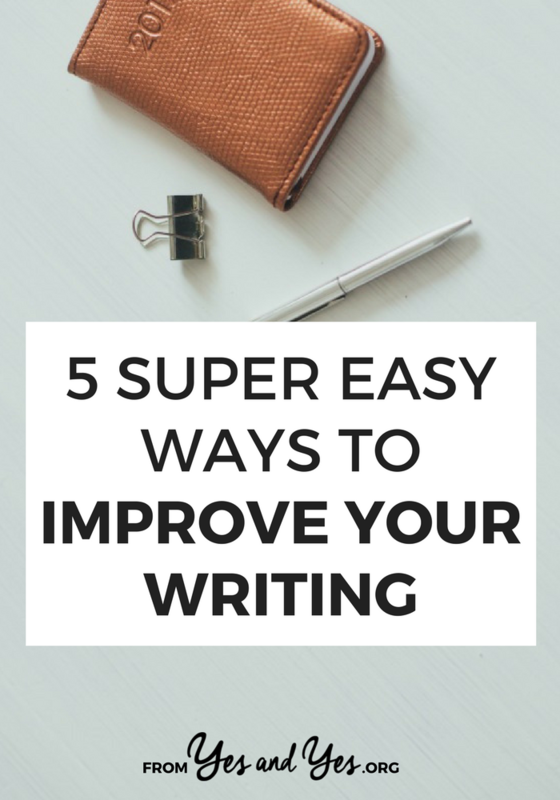 How do you improve your writing without making writing-improvement a full-time job? Surprise! Absolutely No One Has It All Figured Out. Sometimes I find myself thinking in the same vein as TV shows I watch. After many episodes of Downton Abbey I think in a British accent. Watching the West Wing leads to glorious speeches and ants in my pants to walk and talk. “inadvertently start writing like the book you’re reading”– This is SOOO me. I try to balance out the books I read so I don’t accidentally steal someone else’s style, though haha. I’ll absolutely be checking out those podcasts, too. Thanks for another awesome post. I think it’s related to your #2 tip, but mine would be to “read up”. It might sound snobby and pretentious, but I find that if I read certain blogs or articles I find myself wanting to type words like “amaze” and the apparently trendy version of this word that has balls attached to it. (See? Can’t even type the word.) That is an absolute no-no. Sometimes I go back to the notes and sometimes I don’t. Sometimes I have no idea what my notes mean or I completely forget about them. But I still do it. Note-taking is a habit I instilled in myself since I was old enough to write. I loved this post. I’m truly guilty of writing in the style of another person, so much so that I am currently writing a second book and am forbidding myself to read almost any book whatsoever during this time in case I sound as though I am ‘copying’ anyone else. But perhaps I should dive back into my teeteringly-high book pile and embrace it? I realize this has nothing to do with anything, but I feel the need to confess that I sometimes start speaking with a British accent (I’m from Washington State) after hanging out with my British friend. Different, but kind of the same, right? After working on updating our website for too many hours today I found great pleasure in smashing the crap out of a few hundred tennis balls this evening. Not lazy, but rather like pushing Reset. I too am guilty of these habits – I push until I can’t do another thing. My trick is to get out of the house, leave technology behind & just “be” for an hour (if possible). Good luck! These are great tips. Similarly to your #2, I recently redesigned my blog, and spent many hours beforehand examining popular blogs I love (including Yes and Yes) to figure out what exactly I liked so much about the layouts/color schemes/fonts. It still doesn’t look perfect, but it’s way less amateur-looking now. These are great tips, Sarah! As an editor, I especially like the suggestion to print it out – that is so true. One further idea is reading your writing aloud. Ideally, in most situations you should be able to read it easily in your natural manner of speaking.